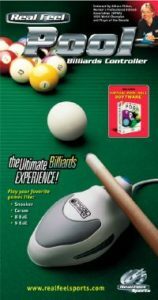 This product allows the user to play simulated pool with a real pool stick. The controller fits in the palm of the hand and fingers wrap naturally over the top of the cue ring that holds the cue stick. To shoot, the user simply lays the cue along the top roller of the peripheral and strokes the cue using the player’s natural motion. Table rotation, aiming, fine tune aiming and angle placement on the cue ball are controlled by depressing the buttons located along the bottom edge of the controller. The controller comes with its own cue stick and has been designed to accommodate a real pool stick. POOL SHARK VIDEO. Canadian reporter Natasha Kong doing a product review of Real Feel PoolShark for the Discovery Channel. The piece was filmed at a popular pool hall in Toronto. It demonstrates the product very well. Pool Shark is endorsed by Allison Fisher, the Women’s Professional Billiards Association (WPBA) 1999 World Champion and Player of the Decade! 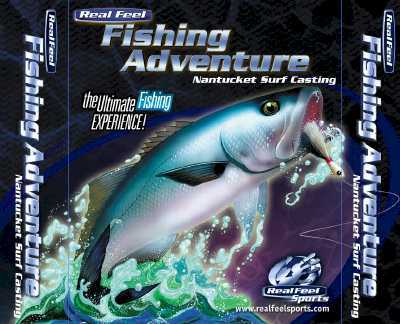 Real Feel Fishing marks the introduction of both the Real Feel Fishing controller and Miacomet’ first in a line of complimentary software titles Real Feel Fishing: Surfcasting Nantucket. Surfcasting Nantucket is an incredibly accurate and fun simulation of surfcasting on New England’s historic and picturesque Nantucket Island. The combination of controller and software is the Real Feel™ Fishing Adventure System which allows players to experience the thrill of casting a lure out into the pounding surf and wrestling a reluctant blue, fighting sea bass or any of several dozens different types and sizes of fish back to the beach. During the struggle, players feel the excitement of the initial strike on the bait, the battle to outwit underwater opponents who run towards shore or dive to the bottom in hopes of breaking loose, and the jerks and pull on the reel as fish as large as 70 pounds fight for survival. In addition to Surfcasting Nantucket, players can use the Real Feel Fishing controller with other popular titles for PCs and game consoles, as well as subsequent titles from Miacomet for fly, bass, and other fishing venues. The Real Feel™ Fishing Controller is approximately 30 inches long and plugs into any PC. The controller takes the place of the mouse and keyboard and controls all cursor movement. When fishing begins, the user can cast, retrieve, hook, play, fight and land fish. The Real Feel™ Fishing Controller controls a digitally sampled fisherman on the screen that moves in real time with all the user’s actions. The product is protected by a patented cast, strike, and fight systems (Patents 5,730,655 and 5,542,672 Fishing Rod and Reel Electronic Game Controller) inside the rod & reel that makes this product a truly virtual experience. 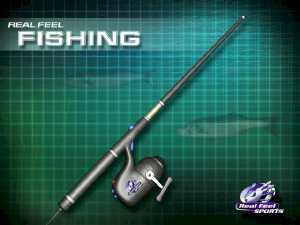 Casting with the Real Feel™ Fishing Controller rod simulates real casting. To cast, the user presses the trigger button while pulling the rod over his/her shoulder and then throws the rod forward as the button is released. Distance and accuracy of the cast are based on forward velocity, lure weight, and button release timing. The strike system simulates the feel of a nibble or strike when a fish hits the lure. Once the fish is hooked the user then feels the weight, run, and the fight of the fish as he/she turns the crank on the reel. This product is estimated to retail for between $69.95 and $79.95 or higher if positioned to upscale customers. Fishing was the fastest growing sports software segment in 1999 growing 398% from 172,000 units to 857,000 units. Designed to also support Xbox Platform. Real Feel Golf, brings golf lovers the most accurate and entertaining golf experience outside of heading to the links for the day. Utilizing proprietary and patented technology (See Patent 5,685,782 Golf Practice Apparatus and Patent Pending Laser Light Golf Simulator) the Real Feel golf club knows when a player has sliced, hooked, or topped a ball, as well as when the player has dug a major divot into the course. This amazing club will match the experience offered by expensive golf simulators at a fraction of the price. 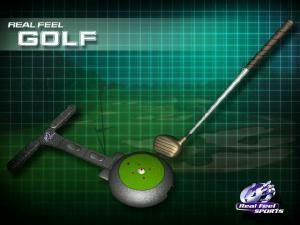 In addition to recreational gaming versions, Real Feel Golf will also be available in special ‘Teaching Pro’ editions. These innovative products will include bundled software and aids designed to help even the most confirmed duffers improve their games before heading out to the course. Real Feel Golf is a complete and accurate golf software simulator controller. It comes with two components. The Golf Club and a Floor Reader Plate. With the ability to give the player accurate swing data and several levels of difficulty/accuracy, Real Feel™ Golf is not only an entertaining game but also the perfect indoor golf training aid. It provides players the opportunity to improve their golf game, in the home or office. Real Feel Golf is designed to work with the leading publishers of existing golf games like EASports’ Tiger Woods PGA Tour Golf and Access’ Links. These relationships will provide a huge installed base of users that can benefit from this improved interface to their favorite game. This Real Feel Golf base edition is estimated to retail for between $59.95 and $69.95, and the Real Feel Golf Pro or Teaching Pro edition is estimated to retail for between $149.95 and $199.95. Golf is one of the largest sports software segments with sales of 1,197,000 in Console Software sales in 1999 and 1,766,846 PC golf software sales in 1999. Golf products continue to grow in popularity and golfers have low price sensitivity when buying products that extend their enjoyment of the game. We project unit sales of well over 100,000 per year of this peripheral. With our patent protection, no other manufacturer can offer a similar product in this price range, and the accuracy of these units is better than the $30K+ simulators in the market today. The product will be available for release for Q2’01 targeting PC, PS2, and Xbox. 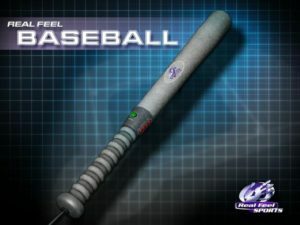 Real Feel Baseball allows a player to step up to the plate with a realistic bat and take a shot at hitting one out of the park. Designed to accommodate both fastball and softball enthusiasts. Velocity Sensitive Swing Characteristics gives the user the control to bunt, pop one over second base, grounders or hit one out of the park based on the strength of their swing and timing. Position Sensors (Optional) read the position of the bat throughout the swing plane allowing the user to swing at high, middle and low-pitched balls. 8 POV Thumb Joystick is mounted just above the grip allowing the user to easily control other software features in Baseball such as menu selection, fielding, throwing and running. 4 Micro Switch Buttons give easy access to menu selections and other Baseball simulation software features. The Real Feel Baseball bat is covered in solid foam making it very safe for children of all ages. The product is designed to easily work with all PC and Game Console baseball software. This product is covered by Patent#5,741,182 Sensing Spatial Movement. Real Feel Baseball is estimated to retail for between $39.95 and $49.95. Baseball is one of the most popular sports software segments with unit sales of 1,868,000 in Console Software in 1999. Targeting an audience of Little League age boys and girls we project sales of well over 100,000 per year of this peripheral. The Little League of America has expressed interest in marketing this product to their membership base and providing an endorsement in exchange for a portion of sales ($1-2/per unit). The product will be available for release for Q2’01 targeting PS2 and Xbox. Real Feel Snowboarding allows a player to mount a snowboard and set off to experience the thrill of cutting an edge down the most challenging of trails, practicing different ‘extreme’ stunts, and enjoying the thrill of mastering one of American’s fastest growing sports. The Real Feel Snowboard Controller allows the user to carve turns and perform stunts in a snowboard software program. The snowboard uses force sensitive switches mounted underneath the spring-loaded rails and gives the user the control and feel of real snowboarding motions. By applying more pressure to one side or the other the user can carve turns left or right. Applying pressure forward or backward controls the users speed and jumping up allows the user to gain extra height over jumps. A hand controller attached to the base of the snowboard unit fits comfortably in the users hand and has an 8 POV Thumb Joystick for menu selection and program control. There are also 4 Micro Switch Buttons that are used in combination with snowboard foot motions that allow the user to perform all of the various snowboard stunts. The product is designed to easily work with all PC and Game Console riding board (snow or skate boarding) software. This product is covered by Patent#5,860,861 Riding Board Game Controller. 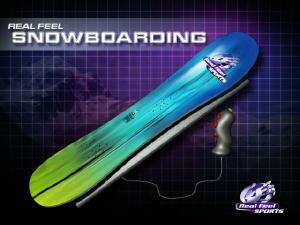 The Real Feel Snowboard is estimated to retail for between $59.95 and $69.95. Snowboarding has been growing at a tremendous pace and so have software sales. Riding Board Console software (Snowboarding and Skateboarding) unit sales were 2,685,000 in 1999 up 28% from 1998. Once again targeting a youthful audience on the Console Platform we project sales of well over 100,000 per year of this peripheral. Product will be available for release for Q3’01 targeting PS2 and Xbox. This product was developed to compliment the past and upcoming Star WarsTM games or by replacing the laser-sword tube with a plastic sword blade can be used with all first person fighting games. This is a patent pending design with patented motion sensing technology using Velocity Spatial Sensors to control all sword motions in real time. All sword swinging motions of left, right, up, down, all diagonals and thrust in and out are sent to the software. 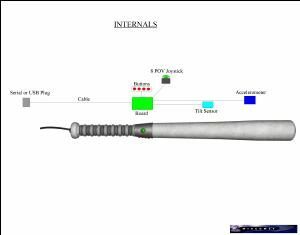 Halogen lamp inside light shaft flashes different intensities as objects are contacted in software. Laser sword handle vibrates in users hand when contact is made with other sword or object in software. 8 POV Thumb Joystick gives the user control of menu selections, character movements, and 3D views. Three Micro Switch buttons mounted on the handle give the user control over menu selections and other software program features. Handle On/Off switch allows the user to power up and down the Laser sword in software programs. Slider Bar controls the length of the Laser Sword light shaft in Software Programs. 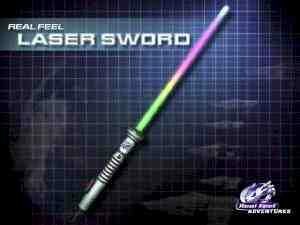 The Real Feel Laser Sword is estimated to retail for between $49.95 and $59.95. Between the millions of Star Wars fans and the 6,000,000 fighting games sold in 1999 the market potential for this product is enormous. Miacomet is actively talking with Lucas Arts regarding a joint venture for this project. Time to market: Q3’01targeting PC, PS2, and Xbox.